On Thursday morning we arrived to the border of Mongolia and China. After living five days in our turned-to-home –train, feelings were of course a bit mixed, but mostly excited, as we didn’t yet know what was going to happen during the day. If we had, the “excited” would have been more like desperate or something. 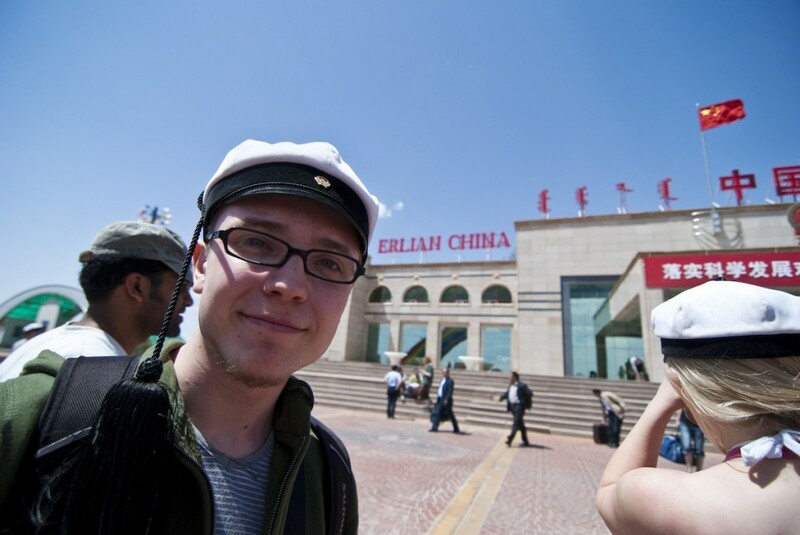 Erlian is a city just behind the Mongolia border. We made it to China! Because of the train schedules and width of the tracks, there was two busses from Erlian (the city in the border) to Beijing. It was supposed to be around 8 hours to 12 hours trip, depending on our luck with the border control, traffic and other random factors The strategy for most of us for the previous evening was not to drink to too much and not to sleep too much, so that no one wouldn’t feel ill but would be able to sleep during the supposed-to-be-long –ride. Antti somewhere in Gobi desert in China during our bus trip. When we arrived to the border control between Mongolia and China, the first bad news was announced. “There’s surprisingly lot of traffic, so we’ll have to wait here for four hours – and yeah, you can’t go out, since we’re surrounded by scorpions.” Needles to say, that there wasn’t any air conditioning and that the air outside was pretty hot. It was really chaotic, we we’re unpacking and packing the buses as we got through different steps, but finally we made it in about 3 hours. When I first woke up after a few hours and looked outside of the window, I was shocked, because we were sideways in the middle of the (empty) highway. Apparently the bus drivers had navigated badly and now we had to turn back, so they had just decided to turn right there. Luckily the road was empty but still, +3 hours to the ride! Pretty soon the same happened again, but this time we were reversing 10 kilometers on the highway, as there wasn’t enough space to turn! The road was closed because of some sort of accident and there actually were at the previous crossroad policemen trying to inform the bus drivers, but they didn’t notice (or care about) it. The reversing took quite a long time and the length of our trip just got increased by 2 hours. While travelling and waiting, we figured out that there’s no point in just waiting, but started to arrange program. For example during the stops the bus guide (who spoke English) was teaching some basic Chinese language to some of us Also it should be mentioned, that three exams were made during the trip. Because of the closed road, the traffic on the other routes was pretty heavy, so we ended up waiting in the lines for a few hours. In the end, the trip took about 20 hours from the border to Beijing. There we took freshening showers and ate a nice breakfast in a hotel, before continuing with the visit to Tshingua University and the final part before Shanghai.